In the previous issue, Aquaman was detained by the US government for supposed acts of aggression by the Atlantean military, which in reality were carried out by an Atlantean terrorist cell known as the Deluge. As the actual Atlantean military investigates the attack, they bump into the US military conducting their own investigation, and misunderstanding the Atlantean's presence as another attack, a fight ensues. At the White House, Mera is accused of ordering the attack while pretending to lobby for peace, her temper finally getting the better of her as she bursts into the facility where they are holding Aquaman who flees with her despite his protests that she was not supposed to save him. As they attempt to escape, however, they leave the facility only to find themselves surrounded by the US military. This issue mostly surrounds Aquaman and Mera's attempt to reach water and escape from the US military. As they fight their way through the troops, they bicker about how poorly everything has gone so far, Mera taking out the bigger guns while Aquaman ensures that no one dies. The bickering eventually reaches its peak as Mera questions if Aquaman even wants to marry her anymore, to which he responds that yes, he still wants to marry her. In Atlantis, word reaches the steward that their king is fighting his way back to Atlantis against impossible odds. Having no other real option, she authorizes the Atlantean army to head to the surface and save their king. In the Antarctic, Black Manta finally meets with the leader of N.E.M.O., who reveals himself to be the Fisher King. While this issue has some great action, it's hard to see it as anything more than filler to pad out the story, as most of this could be accomplished in simply a few pages. The artwork is good and dynamic, with one extremely noticeable exception. In one panel, Aquaman jumps to the side while crying “Mera!”, and the look on his face is nothing short of absurd. It looks like the angle his face is at is different than the angle of his head, creating a weird visual that, for as big as it is, really should have been fixed. With this one exception, however, the art remains consistently good from the last few issues, with highly detailed backgrounds and smoothly flowing combat scenes. Ultimately, this issue was good, but also slightly disappointing. As much as I enjoy Aquaman showcasing just how powerful he really is, especially with Mera right there beside him, the issue itself just doesn't do enough to further the plot. 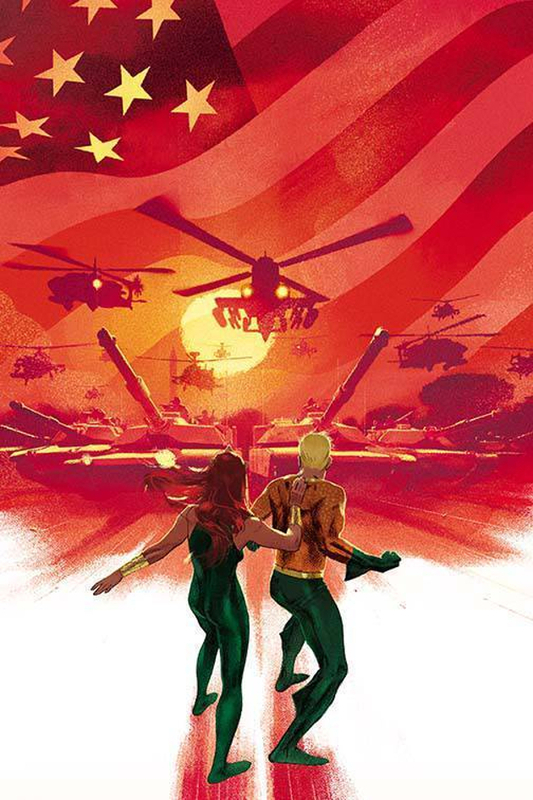 Aquaman and Mera head for water, fighting the military along the way and... that's about it. The issue was fun and entertaining, I just wish it had had a bit more plot to justify its length. If you're looking for something to show you that Aquaman can hang with the heavy hitters, however, this is the issue for you.